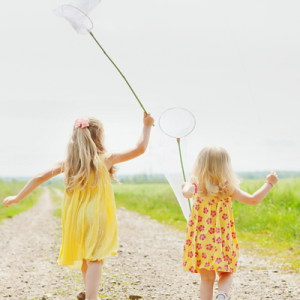 I’ve always admired little dresses with tiny little pintucks on them. 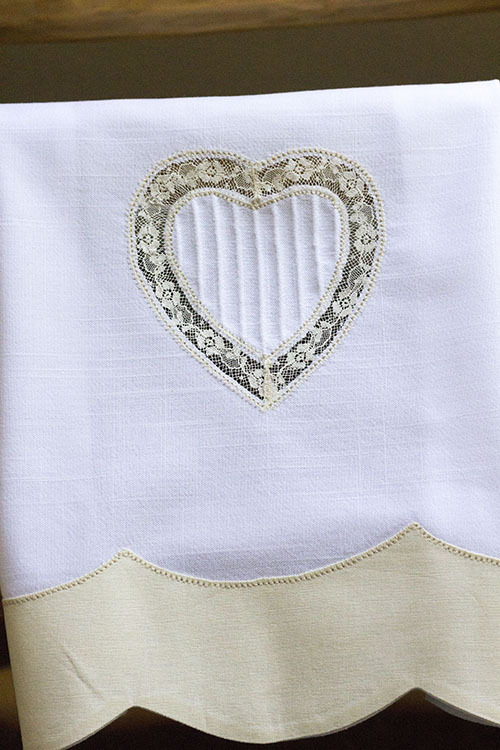 Those little, almost magical, raised lines that give such an elegant, old-fashioned and charming look to the garment. Do you love the look of pintucks also? 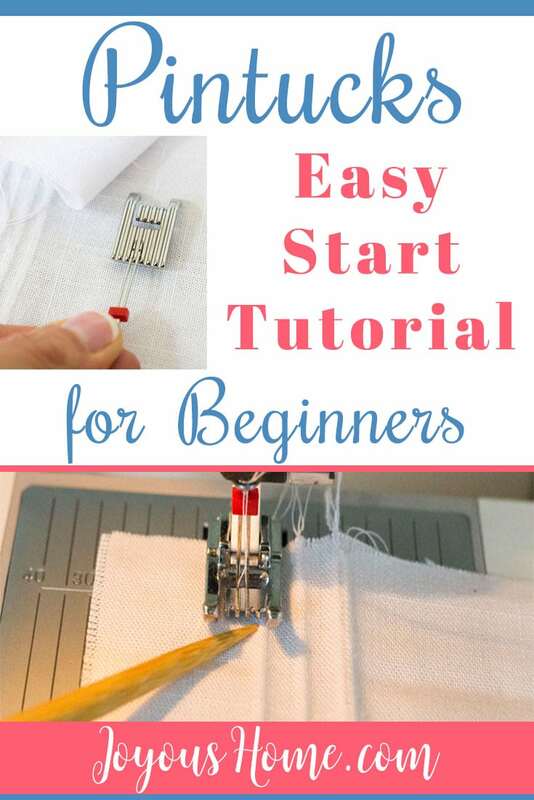 If so, this post, Pintucks for Beginners, is exactly what you need to get started! First, I’m a beginner. I recently learned this technique and was thrilled to share it. I’m preparing to make some fun things with this method in our newsletter. If you are experienced in making these lovely stitches, I’m always open to comments on how to improve, so don’t be shy. I used linen in this tutorial because I had scraps from the Tea Towel project I showed at the end. The pintuck presser foot is available for most brands of machines. The foot can have 5 grooves, 7 grooves, or 9 grooves. Your brand machine may have one only one or two of these, not all 3. I’m using a 7 groove foot. Pintucks for Beginners video below! When I first saw the pintuck foot, I thought it really had to have a tricky feature to it, and all those grooves somehow magically produced the pintucks. I was put at ease when I learned it was just for spacing your pintucks. The spaces in the foot are for previous pintucks made, and to keep them evenly spaced. You’ll need twin needles to do pintucks. The needles need to lay in the grooves without stretching out or pulling in, they should lay flat within the grooves. I would start with a 1.8/80 on a 7 groove foot. You are looking at a 1.6/80 on a 7 groove, and they moved ever slightly, but still worked for me. 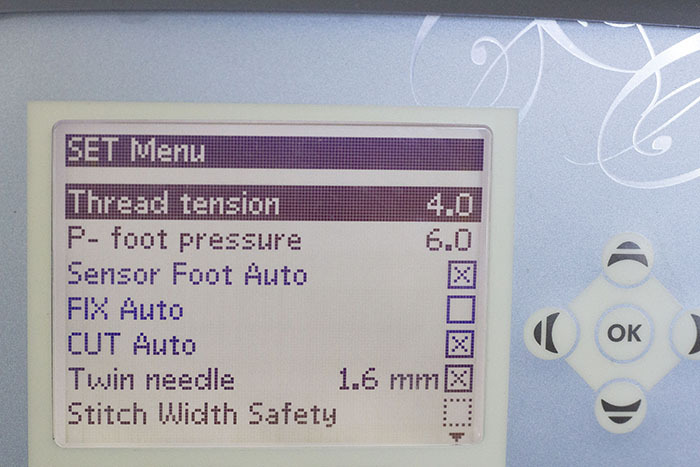 Once you have your twin needles threaded and foot on and ready, take a quick peek at your stitch menu and tension settings. Use the regular straight stitch set to 1.0. 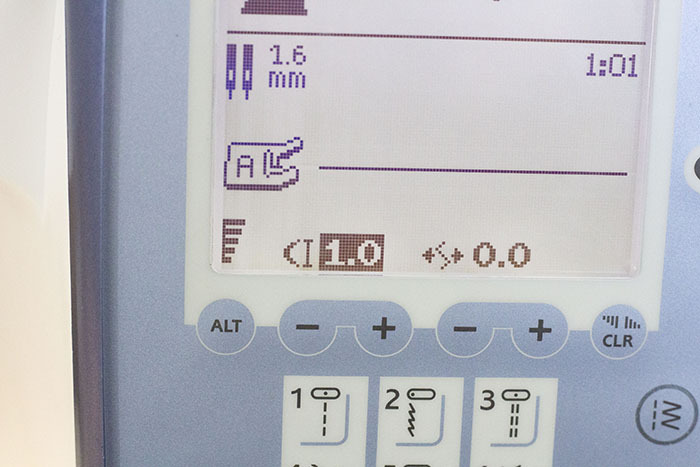 If your machine has an option to select the size of your twin needle, set the size. I have my needles set at 1.6 mm. (See the video). My tension here is set at 4.0, which I won’t change unless I want to see if my tucks will raise just a bit more. Let’s begin. Cut a large scrap of fabric, maybe 8″x15″. Remember, the needle will always stitch from the middle. 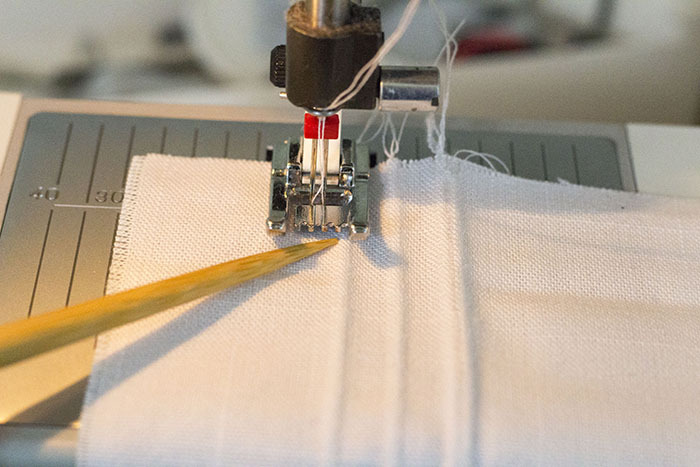 You’ll make your first line of stitching before deciding on space. Watching the video at this point is a good idea. 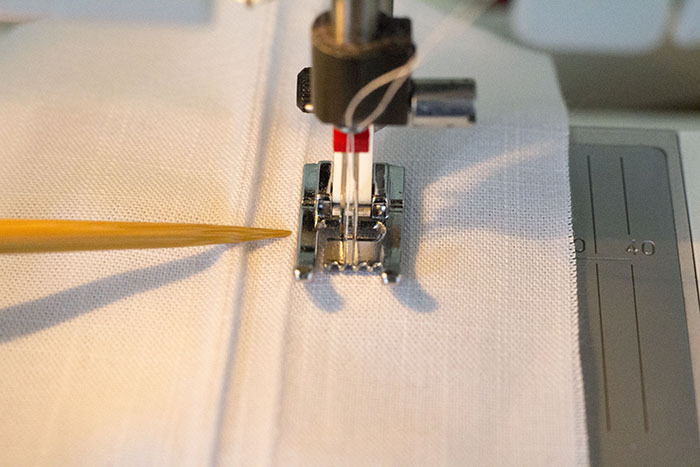 Once your first line is made, line up the edge of the foot with your first line of stitching. Sew another row. How does your next line look? Far enough apart? 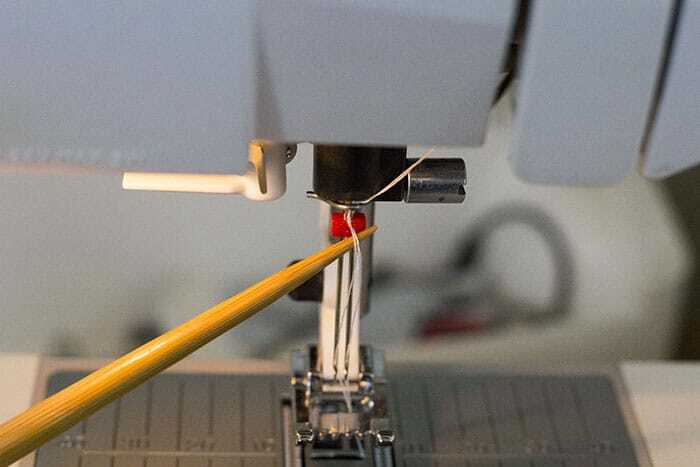 This is really a preference unless you have a pattern that tells you where to line up the next stitching line. The stitching below is using the edge of the foot. Practice several lines using the edge. 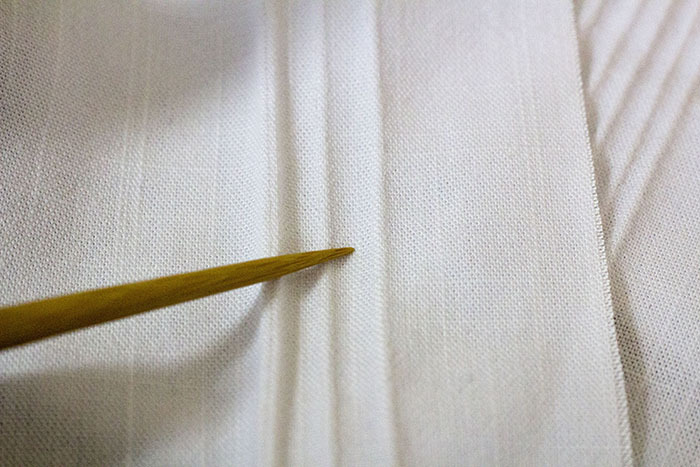 Now, on the next row, skip one groove in the foot, and line up the stitched pintuck in that groove. Stitch. A little closer to the previous stitch. You can see how the foot works now. A Flat Pintuck – What Happened? 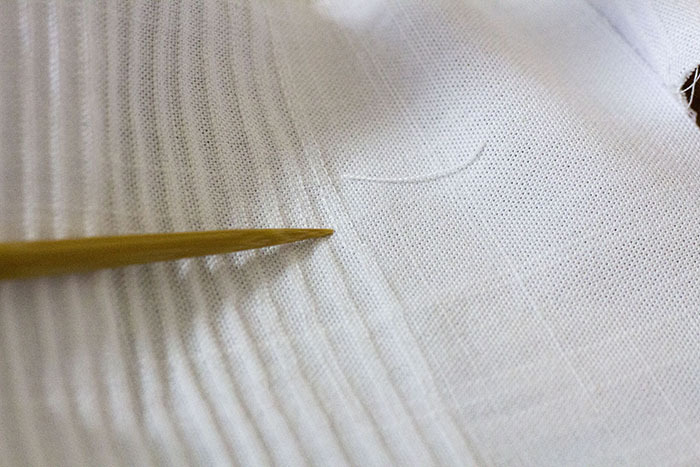 If you just started and your pintuck is flat – did you remember to decrease the stitch length to 1.0? Start there. If it’s still flat, tighten the tension just slightly – just go in small increments. 4.0 to 4.2 etc. 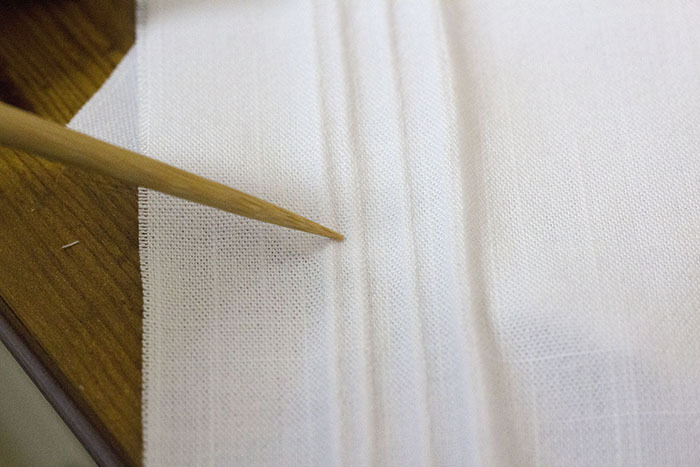 If you’ve been sewing along and all of sudden your pintucks go flat, make sure your settings didn’t revert, after that, there is only one thing I’ve found that dumped my tuck – the thread guide! My pintuck went bone flat after a few rows of successful stitching. 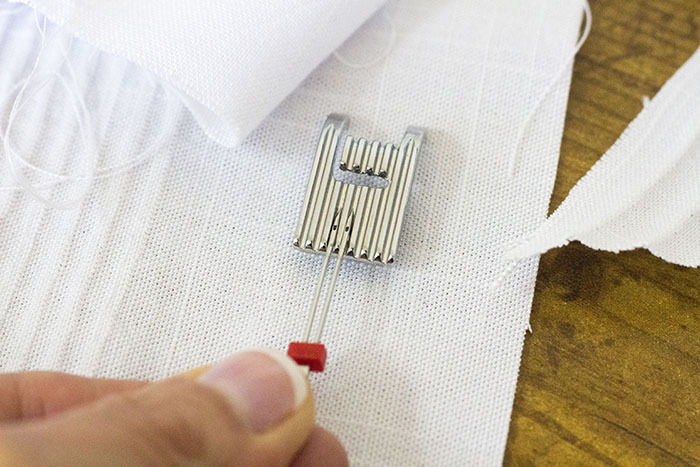 Once you get going, it’s hard to pay attention to your double thread in the guide, but it needs to stay there. Watching the pintuck in the foot is the focus because it’s very easy to move off the line. 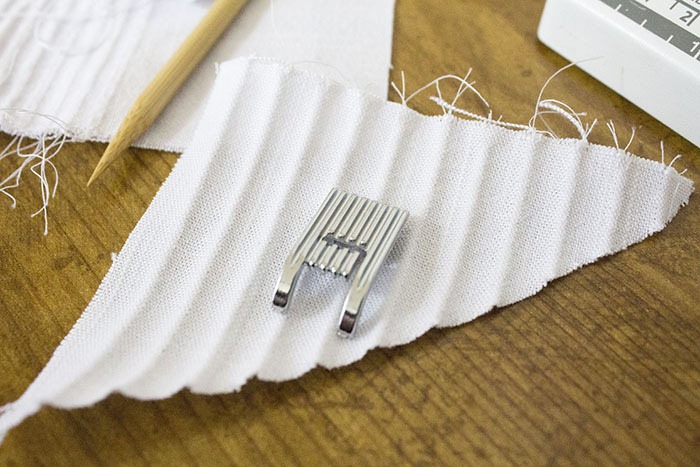 But, make sure to give a quick peek to the thread guide as you sew. I put the thread back in and I was on my way! 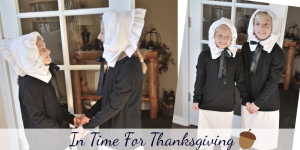 What Did I Make With My Pintucks? I’m working on a licensing class to be an heirloom sewing teacher with Martha Pullen. This was a class project, and the pintuck insert was for this pretty tea towel. I have many ideas for the use of this wonderful stitch. Be sure to sign up for our newsletter if you haven’t already! Nice instruction. Great job on tea towel.